WordPress is all the rage these days. You can learn to use it yourself, which is great. Chances are that, as your business grows, your time to work on your website will dwindle. You may realize that you need some help in this area and that it’s time to consult a professional. You know what they say: admitting you need help is half the battle! When looking for a WordPress professional, the person’s knowledge is important. He or she needs to know WordPress inside and out. While skills are important, customer service and professionalism count for just as much. Choosing a WordPress professional isn’t easy, but this guide can help you narrow down what’s important. WordPress support services are necessary and many in number, not to mention absolutely vital, but you want someone who will fit your business and its needs. When you’re thinking about choosing a WordPress professional, here are some qualities on which you should not compromise. This may seem obvious, but you want a WordPress professional who is fluent with WordPress. Preferably, the person should use WordPress exclusively, but it’s common to find folks who use other platforms, as well. Make sure the person understands the intricacies of the software and keeps up with changes and best practices. It’s ok to ask how long he/she has been using WordPress and whether they can customize templates. Another important trait is knowledge of WordPress security, as more and more sites are getting hacked every day. Details are good here. When choosing a WordPress professional, knowledge of the program is a must. Just as important, however, is the person’s professionalism. Can the person meet deadlines? Is there a contract? Does the business or individual have good working relationships? Just knowing WordPress is not enough; it’s necessary to conduct an honest business, too. Ask your potential WordPress professional about his or her portfolio. Is there one readily online for you to view? The work should be visually appealing and professional, not to mention current. If it’s been a year or more since the person has posted any new portfolio projects, that could be a red flag. Find out why and pay attention. Does he/she have projects that haven’t been finished? Are they out of practice? Another important aspect in choosing a WordPress professional is communication. When you initially reach out to someone, you should get a reply pretty quickly. If you haven’t heard at least an acknowledgement that your message was received, you may be dealing with a poor communicator. That doesn’t bode well when it comes to completing a project. Look for someone who answers email and phone messages in a timely manner. You also want someone who is upfront about how things are going and why. If I tell a prospective client that I have projects underway and wouldn’t be able to start something new for X number of weeks, I’m showing that I’m honest. Most clients appreciate that and take it as a sign that I’ll be upfront about hiccups as the project progresses. Communication is key in website design. I hear too many stories of people starting a project, only to have their web professional “go dark”. They don’t hear any updates on the project and wonder if the web designer has abandoned them. Communication is key in website design. One of the most important questions when choosing a WordPress professional is whether or not there are referrals you can contact. A reputable person or agency will be happy to provide you with names of clients you can talk to about provided services. Unwillingness to do this should be a huge warning sign. I actually include client contact information in my proposals so potential customers can contact those I’ve worked with to ask questions. If they act like they are hiding something, run the other way. 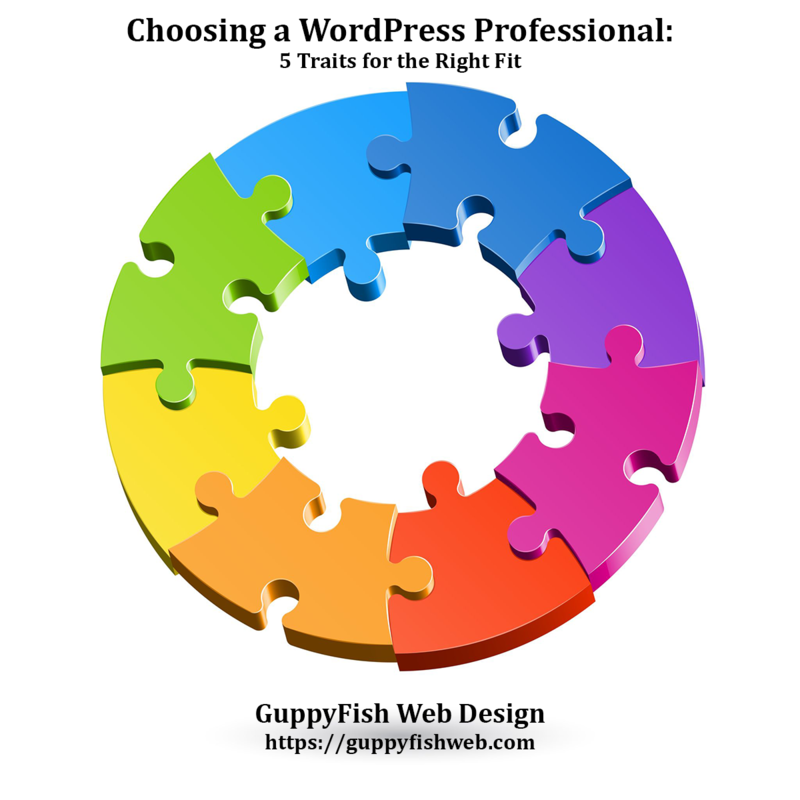 Choosing a WordPress professional can be a daunting task, but if you find the right one and the right fit for your working style, the relationship could continue for a long time. So do your homework, find the right person for the job, and keep swimming along!